In case you missed it, fall arrived September 23. The days have been getting shorter since June and daylight is now less than 12 hours long. Many orchids use the decreasing day length as an indicator that it is time to bloom. Indoor growers need to adjust their grow-lights appropriately. It is not necessary to make constant changes in day length, but it is necessary to shorten day length if you want many orchids to bloom under lights. Some indoor growers rely on light through windows to supply all the light their orchids need. Those with good southern or eastern exposures are often very successful in getting flowers each year as long as they allow their orchids to experience a day length change. Many cattleyas get confused if incandescent lights are turned on nearby at night. I suspect that many cattleyas that are grown indoors do not bloom because of external light at night. Fall-blooming cattleyas are very sensitive to shrinking day length and external night lights confuse them. Large-flowered phals require a cool temperatures to initiate the growth of flower spikes. Some growers leave their windows open for a few weeks in the fall, not only to enjoy the welcome cool nights, but to provide this cool stimulus for their phals. Five to ten nights at 55-65 degrees are more than enough to initiate spikes. The key is both the low temperature and a 20 degree change from day to night. After that, it is best to keep them at a temperature above 65 degrees. This is also the time to move those giant pots of cymbidiums from under the deep shade to more sun. Do it gradually so there will not be any leaf burn. Cymbidium growers claim that the best flowers come when they allow their cymbidiums to almost reach frost conditions. Some cover their plants with a product called “Frost Proof”, which protects them from frost even down below freezing. Cattleyas still maturing bulbs will produce large, plump bulbs now that night temperatures are in the 50s and the day is not nearly as hot. This can be quite a contrast to the thinner bulbs that are produced when both night and day temperatures are very warm. Most members of the vanda and angracoid groups do not appreciate cooler nights and will decrease their growth rate. They do, however, seem to produce flowers with more vibrant colors when night temperatures are cool. If you tend to have cooler conditions than most warm growing vandas prefer, select vandas that have a good dose of Vanda coerulea in their parentage as these prefer cooler nights. 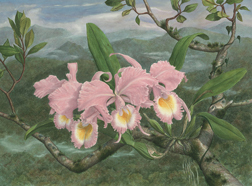 There are members of many orchid groups that come from cooler clines. Many miniature phals, e.g. lobbii, parishii, and their hybrids, such an Phal Mini Mark, really thrive when day and night temperatures are lower. Phrags, especially anything with Phrag besse in the background, really struggle in summer’s heat, but grow quickly once temperatures cool. Lower temperature and light usually means that your orchids need less water, although this also depends on humidity as well. Avoid over-watering this time of year. Your orchids can handle less water, but you could lose all those roots you worked so hard to grow if you continue watering at the same rate as you did in summer. The exception is for those that grow indoors, as most homes these days are air conditioned in summer and heated in winter keeping indoor conditions (temperature and humidity) about the same year round. It is unnecessary to fertilize most orchids now, although most seedlings and phals still require fertilizer. Generally, there is enough fertilizer in pots and on the medium to provide the little your orchids need now. This is an ideal time to really flush pots with high quality, low solids water because the extra drying experienced by orchids in winter will expose their roots to concentrated salts retained on media surfaces. In cases of high fertilizer application or hard water, these salts can damage roots. Some orchid groups, such as the genus Eulophia, nobile-dendrobiums, catasetums, etc, become almost totally dormant and lose their leaves in winter. They may need to be moved to a location where they receive only a light misting occasionally. Take a careful look under pots and leaves if you have had your orchids outside during the summer and now plan to move them into the house or greenhouse. If you have just a few plants, a drench of liquid Sevin (one teaspoon/gal) will kill anything you do not want, including slugs and snails. Do this now, before a sudden cold snap forces you to quickly drag your orchids inside or you could be dealing with bugs and beasts for the entire winter.